Pictured: Day Five of the 2009 Global Green Challenge. Having crossed the border into South Australia, we lost an hour because of the time zone change. I much prefer daylight savings when it works the other way – and you get an hour’s extra sleep. The terrain was like a moonscape most of the day, with rubble either side of the road as far as the eye could see. You could even see the curvature of the earth on some sections. What an amazing country we live in. The length of time might not sound like much (to those used to nine hour road trips from Melbourne to Sydney or 12 hour road trips from Sydney to Brisbane) but it is slow going when the concentration levels are so high – and the air-conditioning is so low. We also had to factor in what affect traffic – and three sets of lights and a roundabout – might have on our average travel time once we arrived in the bustling Port Augusta. So most teams tried to keep to a reasonably high average speed, but it was again difficult conditions to maintain economy, with long climbs and strong headwinds. We also lost a little bit of time having overshot the compulsory stop by one driveway entrance. There was no event signage pointing out the compulsory stop (although we were told where it was, just not the exact location of the car park), so we were about to continue until we saw other competitors parked up. Luckily we didn’t drive any further down the road! As we pulled up, the solar cars arrived to get serviced there as well, so it was great to actually to see them up close and with their high-tech solar panel lids off. I thought driving without air-conditioning switched on was a bit of an inconvenience, but being couped up in these low slung machines must be completely exhausting. 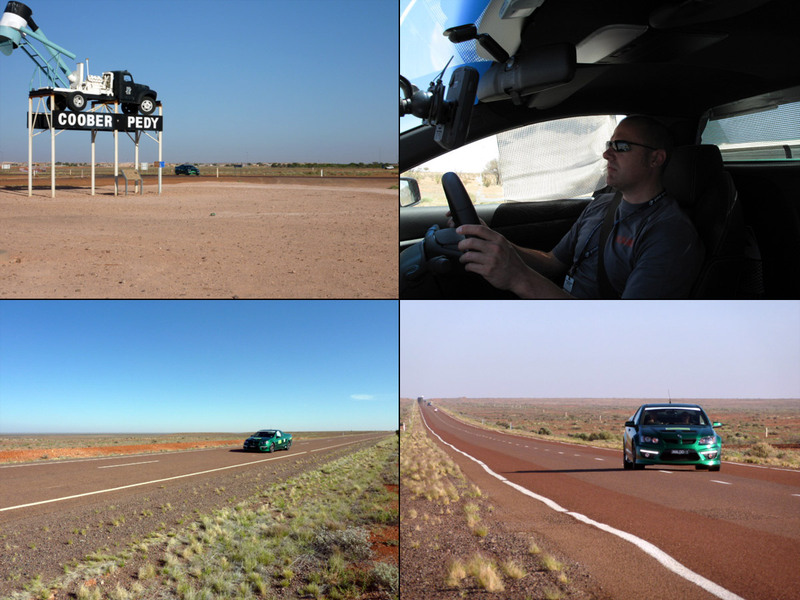 The results for Day Four were issued as we sat down for dinner on Day Five, after each team refueled their own cars earlier in the morning in Coober Pedy. This was done so the cars could be refueled while they were cooler, so each car could take their maximum fuel load, and there would be less risk of fire if there was an overflow. The latest results showed that the order of the field and each car’s consumption rates generally haven’t changed. I guess this shouldn’t be a surprise given that we’ve travelled more than 2500km by now, so the fuel figures have started to average out. That means the HSV Maloo ute is still leading by a comfortable margin with an improvement on its fuel rating label figure by 49 per cent, ahead of the Ford Falcon XR6 Turbo sedan (40 per cent improvement) and the Holden Commodore Omega V6 Sportwagon (31 per cent), according to provisional figures from Darwin to Coober Pedy. 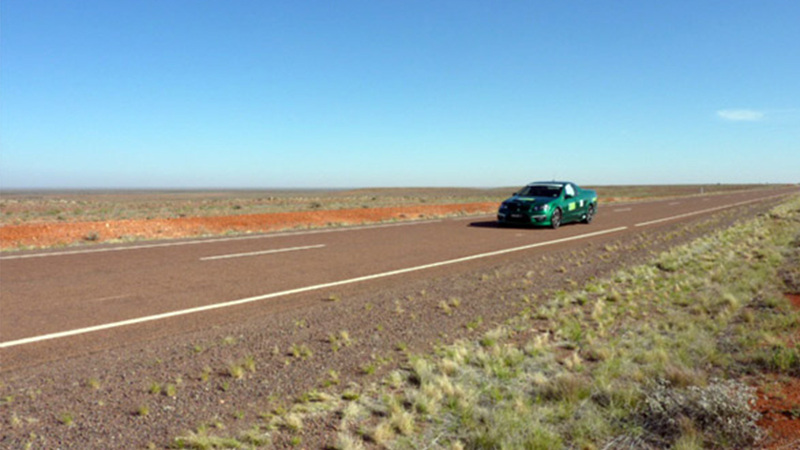 Day six sees the teams head off on the 300km journey from Port Augusta to Adelaide, where they will get a well earned overnight rest and prepare for the final, city driving stage on Friday. HSV engineer Gerry Bechet started our driving shift again today. He knows the car better than me, and is better at bringing it up to speed and up to temperature gently. As we’ve done every day, we caught the XR6 Turbo within the first two hours, swapped road positions a few times before finally getting some distance between us. Over the past week they have tended to keep a constant speed, whereas we tend to ride the hills. Our makeshift sun shades are going well, although we somehow managed to trap a few flies in the car this morning. I hope there aren’t many insect enthusiasts out there because, I regret to report, the flies didn’t get to complete the journey with us. We dispatched with them as quickly and humanely as we could, with a quick whack. One of them is still stuck to the inside of the windscreen. Gerry dislikes flies as much as I do, plus it gave us something to do for a while as we chased them around the cabin with our hands and a rolled up bit of paper. Cabin fever anyone…? The outside temperature climbed again today. It was pretty comfortable at first but by the end of the day we were back in the low to mid 30s, which is borderline uncomfortable. We’ve got our eskys well packed these days, largely thanks to the enthusiasm of our support crew. We call them a crew, but it’s two guys: HSV engineers Leigh Russell and Rob Davis. Rob’s got an eye for a bargain, and I think Barbeque Shapes must have been on special at the last town we went through because we’ve got enough of those now to last us until the next Global Green Challenge. To be fair to Rob, the oversupply of salty snacks was my fault. Earlier in the event, when Gerry and I nearly drained all the salt out of our bodies because we were drinking so much water, we actually craved salt. We put the call out to Rob and he delivered. In spades. Well, boxes. Gerry and I reckon we’ve drunk almost as much water as the car has had fuel. Funnily enough, in a weird, self-fulfilling cycle, the more salty snacks we eat, the thirstier we get. Oh dear, when will this merry go round end! Some of the manufacturer teams competing in this event have more support vehicles than the organisers. Previous blogs have given examples of this. Our humble outfit has just one support car – and two very capable HSV engineering chaps. But the boys have developed new skills, and maybe even a new hobby on the Global Green Challenge. While other teams have film crews and camera crews, the HSV outfit has Rob Davis and Leigh Russell with their happy snap cameras to help record what is hoped will be a historic occasion for HSV. Rob and Leigh blast ahead of us all day in their LPG Senator, only to pull over at a nice spot further up the road and wait for us to come past so they can take a photo. And once we drive past, they jump back in the LPG Senator and blast past us and do it all again. Not once have the guys complained (to our faces, at least) and they’re getting more and more creative as each day goes by. So, here’s an official thanks for the memories (well, photos) and helping us out with snapping some extra pics. Car paparazzi look out!